A blog about the games I'm playing. Use a Tactician - Tacticians works well since she's a Blaster, but Scarlet Witch is often paired with WWII Captain American with his Shield Guard up for 2 rounds from the get-go. This basically means you have to either defeat him first or use stealthy attacks that avoid "Protect." I recommend just defeating Cap first in this instance. Avoid applying debuffs if possible - with the frequency of Chaos Shield, they tend to buff and regenerate Scarlet's whole team (occasionally with several stacks of "Regeneration"). Hit Chaos Shield with your weakest non-debuff attack if possible - a small ding will remove the shield just as well as a big one. Be Lucky - Haha, probably not the most helpful bullet point, but one time Scarlet Witch's Probability Field applied Power of Four (gain four turns in succession and then that hero/agent dies) and Sudden Death (reduces health to 1, fully restores stamina, greatly increases damage dealt, and removes other debuffs) to my already Vengeance(increases attack per stack)-stacked Ghost Rider. I ended up winning that one with a Ghost Rider beat down. Obviously, I got really lucky there, but hey, it happens. 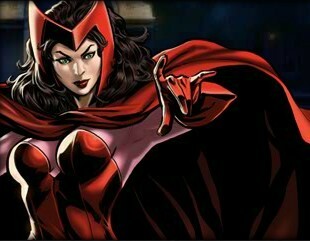 Take care of her first - the longer Scarlet Witch stays, the harder she is to defeat. Focus fire her first if at all possible. Marvel Avengers Alliance: New Daily Lotto! Marvel Avengers Alliance: Free 50 Purple Iso-8s!